Telangana, Feb 9: A man filed a complaint against doctors at NIMS Hospital here for 'leaving' a scissor in his wife's abdomen during surgery. According to the complainant Harshavardhan, his wife Maheshwari Chowdhary was suffering from Hernia and had undergone surgery under the care of Dr. Venumadhav, Surgical Gastroenterologist, on November 2, 2018, at NIMS hospital. "Now since two days, Maheshwari was having severe abdominal pain. Yesterday she was admitted to NIMS hospital again. After all medical tests, a scissor was found in her abdomen in an X-Ray. 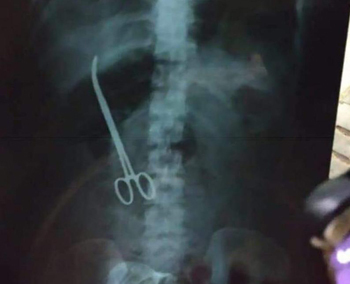 This scissor was left by the doctors' team during her surgery," Harshavardhan alleged. Taking action on the complaint, the police registered a case under Sections 336 and 337 of the IPC against the team of doctors who had performed the surgery of Maheshwari. The case is under investigation, said Vijay Kumar, ACP Panjagutta division. "Maheshwari was having pain in her abdomen. She had undergone Hernia surgery on November 2. Today, a scissor was found in her abdomen after medical tests. The medical team immediately operated and removed the scissor from her abdomen. Her condition is stable now," said Dr Manoher, Director of NIMS hospital. Manoher further said that an internal committee is looking into the incident. After the internal committee submits a report, action will be initiated against the concerned persons, he assured.